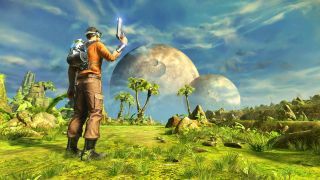 In its quest to grab every game license under the sun, THQ Nordic has snatched up the rights to classic open-world adventure Outcast, acquiring it from its three original creators. Outcast launched way back in 1999, getting great reviews at the time, though not sales. There have been attempts to bring it back, including a remake, Outcast: Second Contact, and a shelved sequel, Outcast 2: The Lost Paradise. Outcast looked like the future when I played it 20 years ago—it was massive alien world that looked impossibly tangible, like a game people would be playing in the shiny 21st century, not in boring old ‘99. It ended up being something of an evolutionary dead end, however, at least until unbelievably massive worlds started appearing everywhere, years later. Like many of THQ Nordic’s acquisitions over the last few years, Outcast already has people clamouring for a sequel. The company's other acquisitions include Carmageddon, Saints Row, and Dead Island, and that’s just in the last year. “Is there any better way to start off a new year than with an acquisition?” asks THQ in its press release. “We don't think so.” Buying games has become its brand. One of the most anticipated results from these acquisitions, Darksiders 3, wasn’t quite the sequel we were hoping to play. Darksiders was picked up as part of the THQ auction and, just as fans hoped, was resurrected with some of the original team. The result, unfortunately, was a less-satisfying third outing with basic platforming, simple puzzles, and no loot. Check out Samuel Horti’s Darksiders 3 review for more on that—it’s not bad, but it does live in the shadow of its predecessor. Obviously, THQ Nordic can afford to buy all of these games, but it would need a lot of resources to put all these licenses to use. At the moment, most of them sit in THQ Nordic’s vault, waiting for a possible announcement. Whether it plans to complete an Outcast sequel remains to be seen, but it now has the rights to do so.